One sheet of wallpaper. 17" wide x 11" tall. Not prepasted. glue or Grandmother Stover's Stikflat Glue. 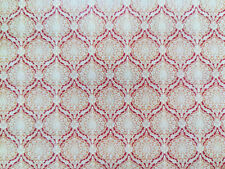 Colors: White with light grout lines. Usable area 16" wide x 11 1/2" high (40.5 cm x 20.8 cm). 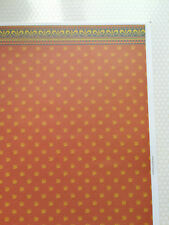 1 Sheet containing 6 pieces to create wall panels. 1 Sheet of containing the 3 wall panels. 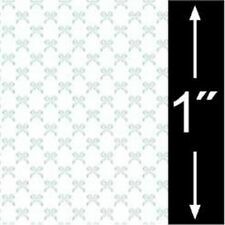 Dollhouse Miniature White Embossed Textured Ceiling Paper 1:12 Scale 17 "x 12"
1 Sheet made from heavy textured paper. Each Sheet Approx. 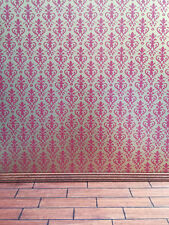 1 Sheet of Wallpaper with various borders. 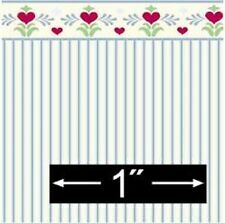 Cut out these borders to use in a variety of ways, along the ceiling, separate different papers or on furniture projects. 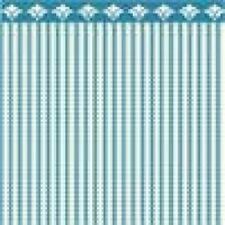 Colors include: Cream, pale pink, pale blue, pale yellow, pale green. One sheet of wallpaper. 17" wide x 11" tall. Printed on 65lb super smooth thin paper. Not prepasted. glue or Grandmother Stover's Stikflat Glue. They are both specifically made for paper. 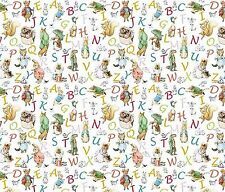 1 Sheet of Wallpaper. 12" high x 17" wide. Colors are blue on bright white. Wallpaper to add a completed touch to your miniature dollhouse or room box. 1in to 1ft. 1:12 Scale. This is sized for a dollhouse. Maroon & Beige Victorian Floral Bursts. 1 Sheet of Wallpaper. 1 Sheet of Wallpaper. Contains pale green and cream. 11 1/2" high x 18" wide. Colors: White with dark grout lines. Usable area 16" wide x 11 1/2" high (40.5 cm x 20.8 cm). Perfect for kitchen or bathrooms. Embossed molded plastic, easy to cut with scissors. Usable area 15 1/2" wide x 10 1/4" high (39.8 cm x 26.2 cm). 1 Sheet of Wallpaper. Colors include: Red/Orange, Gold, Blue. 11 1/2" high x 18" wide. 1 Sheet of Wallpaper. Colors include cream (yellowish white), green and light pink along with hummingbirds. 11 1/2" high x 18" wide. 1 Sheet of Wallpaper. 12" high x 17" wide. Perfect for any room in the miniature house. 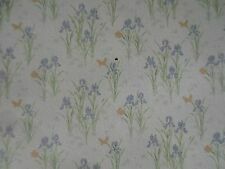 Dollhouse Wallpaper Lot. 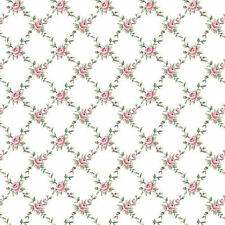 Sheets Floral / Browns /Greens. ~1 Cent Coin added to show scale/size~. DOLLHOUSE MINIATURE Fruits and Flowers WALL PAPER. Embossed molded plastic, easy to cut with scissors. 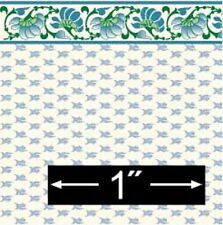 CONCORD AUTHENTIC COLONIAL DESIGNS MINIATURE WALLPAPER 2 SEALED PACKS 10" by 15"